Can't decide which texture scissor to buy? We offer you The Elite Texture Trio, 1 of each model with a massive 20% discount, saving you £355.00! We also offer FlexiPay so you can make smaller weekly payments. You will recieve 1 x The Akechi, 1 x The Soka, 1 x The Blizzard, this set is the ultimate texture pack with every tool you will ever need to chunk, skulp, texture and blend. 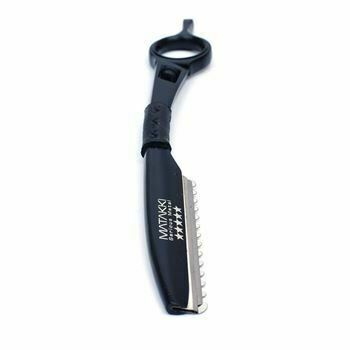 Included with every purchase, Matakki razor, carbon cutting comb, scissor oil, tension key, polishing cloth, maintenance guide and luxury scissor presentation case.